Sure, you could frost the top of your cupcake. OR, you could frost ALL the other sides of it and get double the frosting! 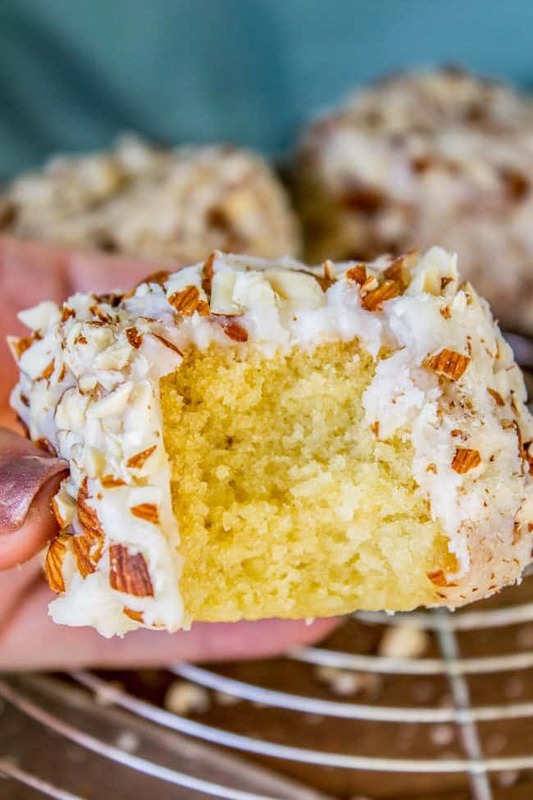 These Upside Down Almond Cupcakes are so moist, so almond-y, and have the perfect crunch! I have an entire drawer full of straws in the kitchen that my family knows they are not allowed to use. They are props for photos, and yes, I’m the worst. I’m supposed to write off all my grocery receipts for blogging. The joke is on me, because I’m the WORST at keeping track of them. I literally have a drawer full of unorganized receipts in my desk drawer in front of me right now, waiting to be filed. I have a really hard time talking coherently to people in the middle of a photo shoot. Imagine doing something that’s really hard and you’re on a time crunch. I’m thinking like a math test or something. You have 20 minutes to finish, and you’re really not sure if you can get it done. Then try to have a conversation with someone who doesn’t realize you’re taking a math test. Photo shoots don’t come naturally for me. Eric is usually at work when I shoot, but one time he commented that I was acting like a dog in heat. HA! I can’t even be mad because it’s accurate. I’m 100% positive that my mom has handed out more of my business cards than I ever have. Yes, this is a business and yes I have business cards. The last one I gave out was to my neighbor Tyrone across the street when he asked for one. Before I handed it over I made him spell “charlatan” on Instagram stories. He only missed one letter! Instagram stories are my favorite form of social media at the moment! It used to be Twitter. Just kidding, Twitter is the worst, don’t even click that link. All my relatives are tired of me asking for their favorite recipes I think. I’m a little obsessed with checking my statistics. I’m not crazy or anything, but I definitely check it once or twice a day. I prefer Stacounter to Google Analytics, just because I prefer bar graphs and I like to see the “Popular pages” link (a quick way to show the most popular post from the last several hours). Today a couple of my top hits were Classic Stromboli and Pan-Seared Chicken and Broccolini in Creamy Mustard Sauce. One time I got 65,939 page views in one day. That was cool. I definitely checked my stats more than twice that day! It’s kind of hard to tell for sure, but I think that this recipe for Chicken Kebabs with Nectarine Salsa is the least visited recipe on my site, with a total of 168 page views since it’s publication in 2012. Maybe it’s because I swapped out one of the main ingredients called for in the recipe that it didn’t take off? Or maybe it’s because I talk about how I used to get sick in the back seat of our station wagon as a kid? I mean I really just don’t get it. Blogging is super fun and exhausting. It’s kind of like having a kid. You buy them a pair of pants and then NEXT WEEK the pants are suddenly total high waters and you have to buy another pair. And then your kid gets acne and wants to be alone all the time. And then you feel so proud when they win the science fair. And then they accidentally crash your car. Up, down, up, down, all the time. But you sure do love them at the end of the day! We spent last week in Richmond, VA to visit my brother who is doing his residency there. We went to this place called Sally Belle’s, right after watching this 11 minute mini documentary about them. I think if every lunch joint in America had a mini documentary made about them, we would all be a lot more excited about lunch! 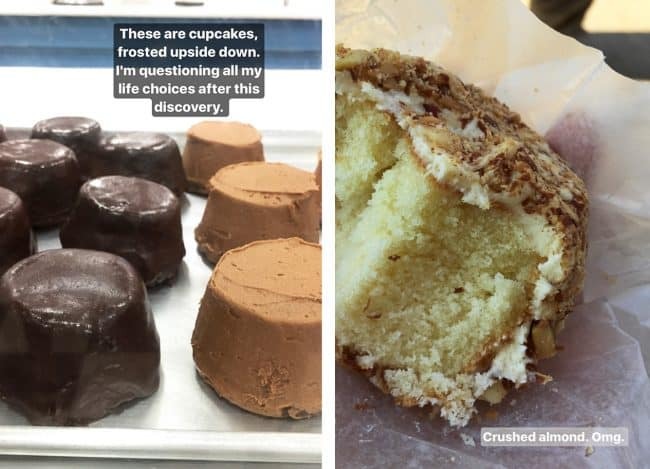 They made a big deal about the boxed lunches they sell (which we ordered to go and ate on our hike in Shenandoah, they were delicious), but I was WAY more excited about the upside down cupcakes. The one on the right was hands down the best one. Today’s recipe is based on this cupcake. Just look at them all lined up! How is this not more of a thing??? Why are we putting frosting on what is already the best part of the cupcake? (You know, like how muffin tops are super moist and have a different texture than the rest? The top dome of a cupcake is the best part.) Why not put frosting on the most boring part of the cupcake, the bottom? I have a lot of STRONG FEELINGS ABOUT THIS! I’m not a cupcake girl, honestly. The bottom is just too dry for me, usually. The edge of a cake is the driest part, so why would I want a whole cupcake of the dry edge? There are of course exceptions. 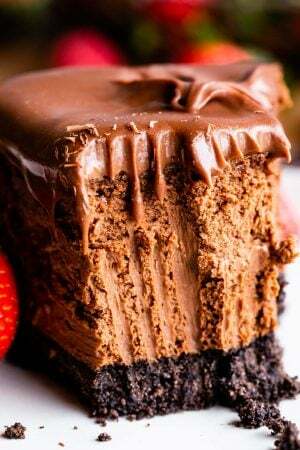 These Cream Cheese Chocolate Cupcakes are the best. 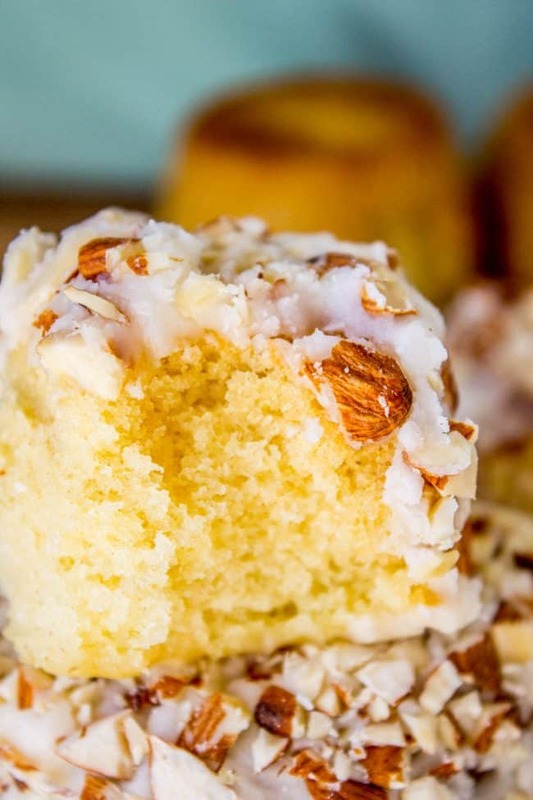 These Lemon Cupcakes are made from a cake mix and they are divine. 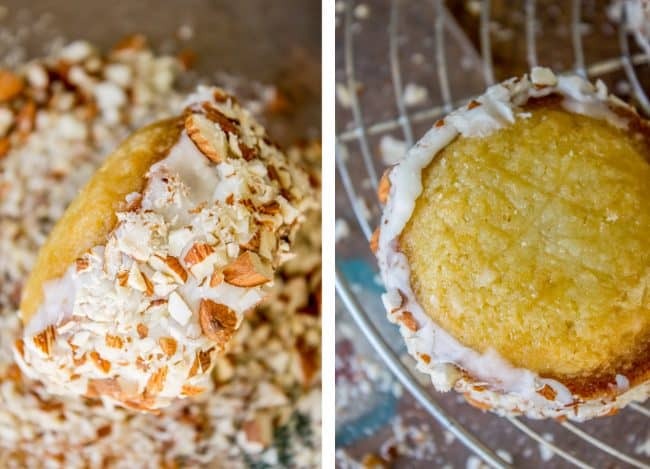 And these Almond Crunch Cupcakes are my latest exception. And NOT just because they have lots of frosting. The cake part is super moist. The recipe is very slightly adapted from this Almond Sheet Cake recipe that I posted years ago. It’s honestly one of the most-made cakes from my blog (in our house). I LOVE almond flavor, and it’s so easy to throw together. I love warm frosting that you can put on right away. So satisfying. 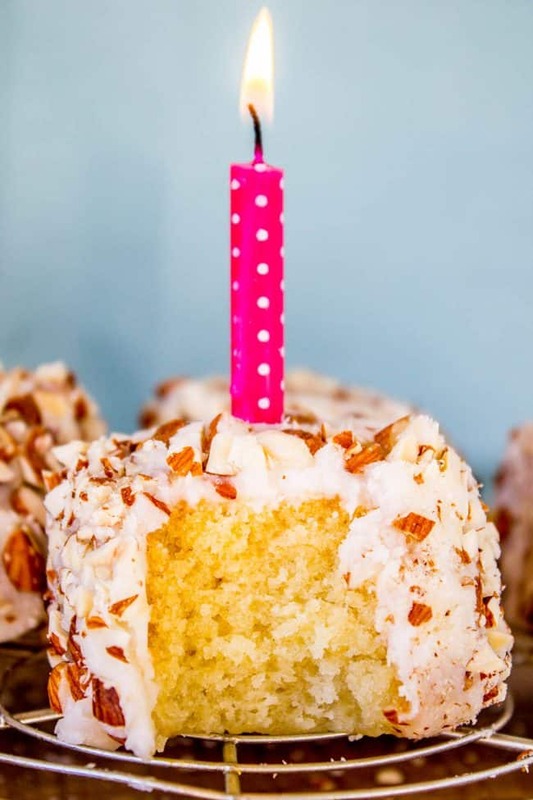 If you are not feeling like making cupcakes (they are a bit more labor intensive), you could also just make the original Almond Sheet Cake and add chopped almonds on top of the frosting. To all my beautiful readers, thank you so much for being here! Obviously the blog wouldn’t be possible without you. I’m so happy to be virtually cooking with all of you! Eating really is just so much fun, isn’t it?? Here are links to all my anniversary (ish) posts, in case you want to take a walk down memory lane! In a small pot, add 1 cup butter and 1 cup water and set over high heat to bring to a boil. Meanwhile, add the dry ingredients to a large mixing bowl or stand mixer: flour, sugar, baking soda, and salt. Combine. When the butter-water mixture starts to boil, take it off the heat and put it into the dry ingredients. Turn the mixer on and beat for at least one minute. (Don't bother washing that pot. You're going to use it again for the frosting). Add the sour cream, eggs, and 1 and 1/2 teaspoons almond extract. Beat again for a couple minutes, scraping down the sides. 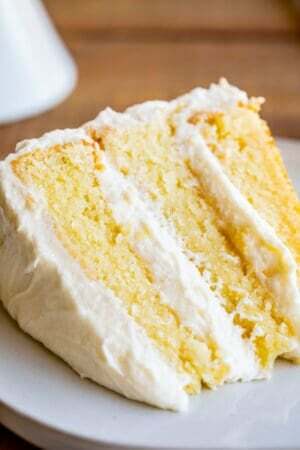 Don't be afraid to let it mix awhile; you need to whip in a bunch of air so that your cake is fluffy. Pour the batter into the muffin tins. I ALWAYS overflow my cupcakes, so I was very careful and measured it this time. The perfect amount is exactly 1/4 cup of batter per tin. It should yield about 22 cupcakes, give or take. Bake the cupcakes at 325 in the center rack. Bake for 18-20 minutes. A toothpick, when inserted in the center, should come out clean, and the tops may become a little golden. Don't over bake, but don't under bake either! Make sure that toothpick is dry. Remove from the oven and let cool about 20 minutes in the pan. Carefully use a butter knife to remove the cupcakes from the pan onto a cooling rack. Let cool completely. You can stick them in the freezer to speed this up if you like. Meanwhile, make the frosting. In the same pot from before, melt 1 cup of butter and 1/2 cup milk. Bring to a boil. In a large bowl or stand mixer, measure out 5 and 1/2 cups powdered sugar. When the pot boils, pour it into the bowl with the powdered sugar. Beat well. Add 1 teaspoon almond extract. (Taste it, if you are really into almond you could even add another 1/2 teaspoon or so.) You can also add a dash of salt if you like. Cover the frosting if the cupcakes aren't cooled yet. It needs to cool down a bit until it is spreadable. It will start to harden at room temperature, even if it is covered, so you may have to reheat it. For example, I frosted some of these 24 hours after making it. I put my metal stand mixer bowl over a pot of boiling water (like a double boiler) for a couple minutes and stirred it to make it pliable again. You could experiment with microwaving but I haven't tried it. When the cupcakes are cool and the frosting has cooled enough to be spreadable, use a small offset spatula or a butterknife to frost the cupcakes upside down, just like a mini cake. 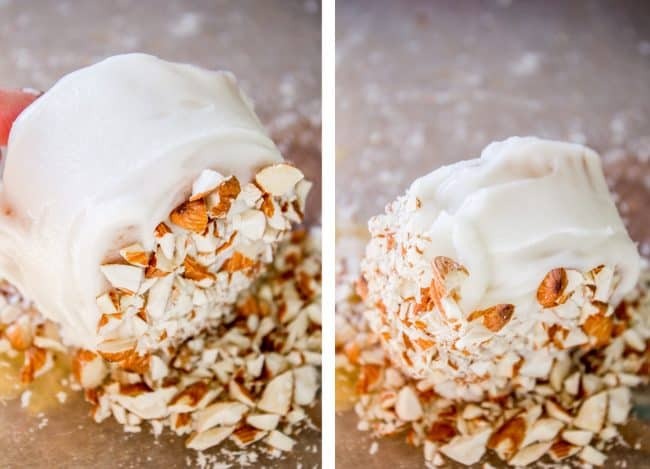 Immediately roll each cupcake in the chopped nuts. Let the frosting set for several minutes before serving. 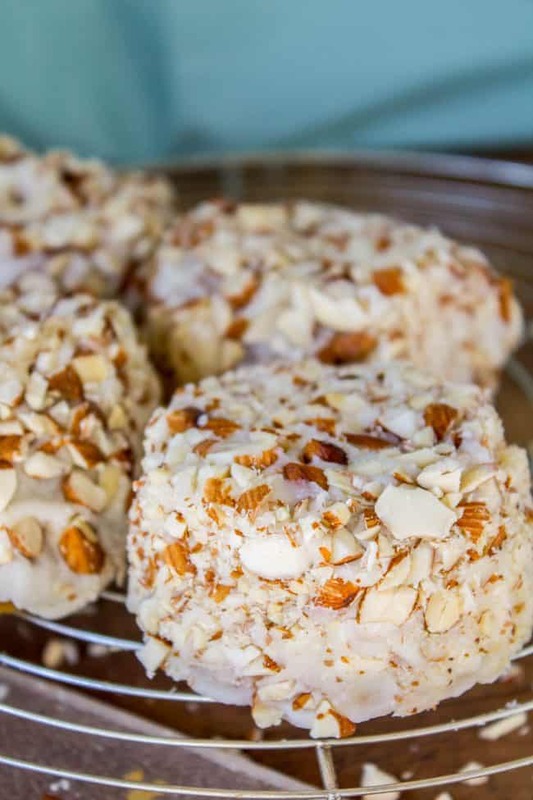 These are best served the first day because of course the almonds will begin to soften. But I actually think softened nuts are delicious too, so it's your preference! 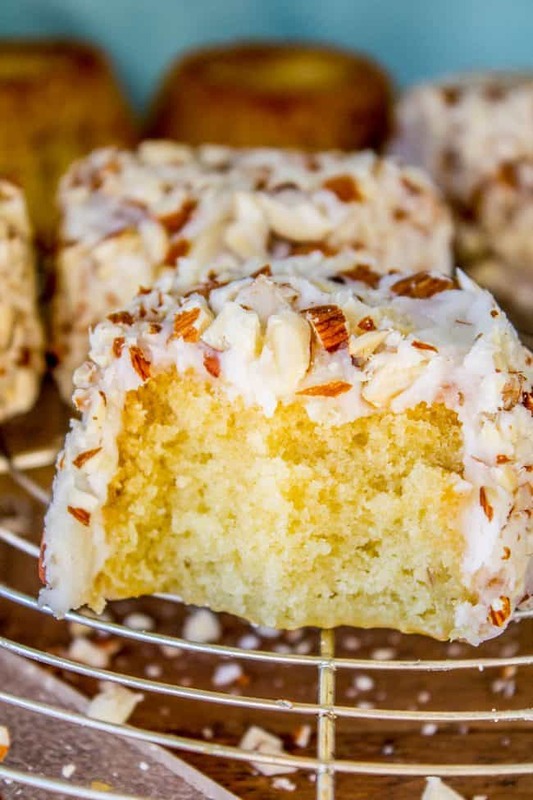 I lightly adapted these cupcakes from this Almond Sheet Cake. 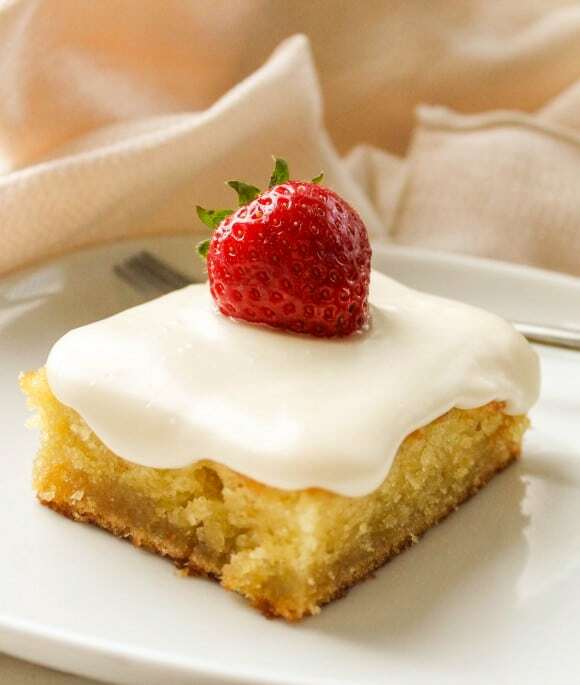 Almond Sheet Cake << here it is! My beloved! 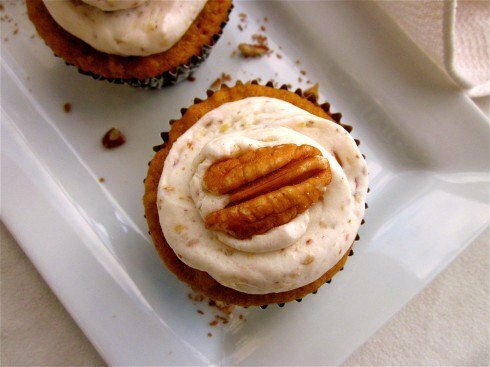 Brown Butter Pumpkin Cupcakes with Maple Pecan Frosting << I forgot about these cupcakes in my list up there. This is a GREAT recipe! 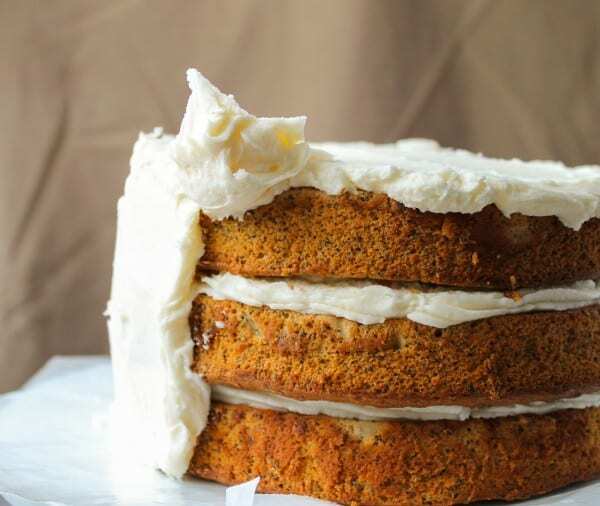 Spiced Poppyseed Cake with Almond Buttercream Frosting << gooood. 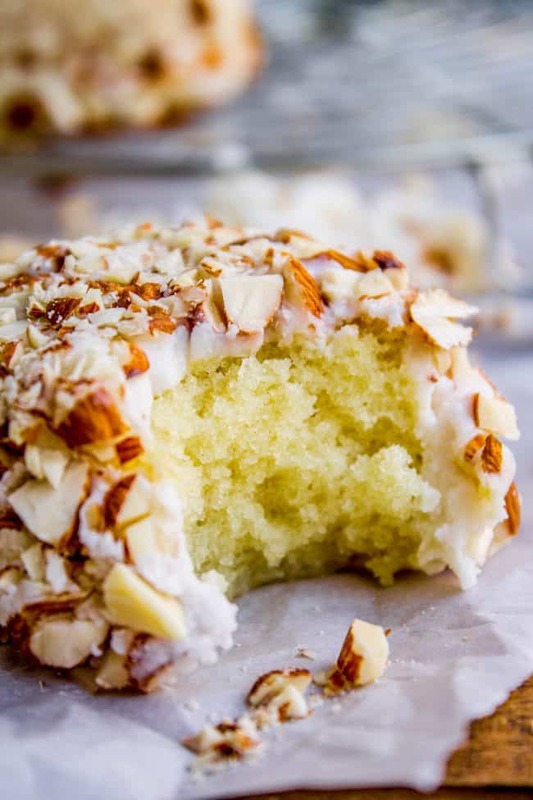 More almond cake ideas from blog friends! So I don’t cook, like at all. 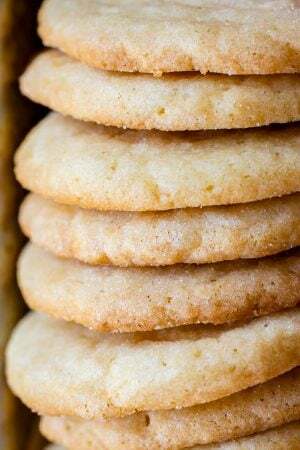 Except for this one browned butter cookie recipe that I got from you. So since the only thing I make that my husband actually says is good is your recipe I’m pretty happy you started a blog 😂❤️ Happy anniversary! Haha that’s awesome Nicole! I’m serious, if I could only make one recipe in the world, I might pick that one too. Lol!! Thank you Heather! Time flies! Happy Anniversary! Here’s to good food! 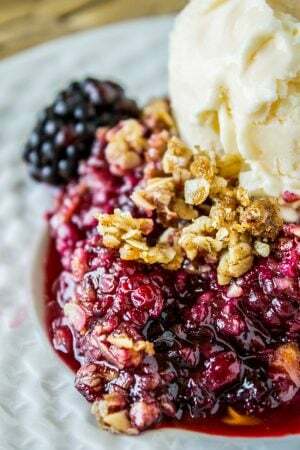 Ooh I love that blackberry crisp, good choice :) Thank you so much for being here Collette, I truly enjoy hearing from you! Thanks for being my biggest fan Mom! Karen, yours is my favorite blog and I frequently make your recipes. You often make me smile, sometimes make me laugh out loud, and always make me feel like I can definitely make whatever you are making. Plus, your children are adorable and you feel like a friend. 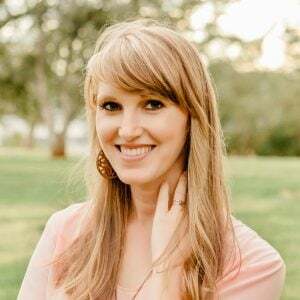 Congratulations on your blog-birthday! Mary, that is the nicest thing to say! It makes me so happy to know you love the recipes (and appreciate the stories to :) Thank you so much for being here! Happy Anniversary Karen! Thanks for always posting such delicious food all the time. You inspire me to cook more often!